60% chance of rain was yesterday's weather forecast for Anacortes and Oak Harbor. In fact, it turned out to be cool and breezy and partly sunny, but rain-free until after dark last night. Such is often the case with predicting weather in the Olympic Rain Shadow. Today, it is dark and overcast with a steady light rain. My garden needed this rain. This photo is of north Whidbey Island taken from the top of Goose Rock on yesterday's hike. Those are the Olympic Mountains peaking through the clouds in the background. 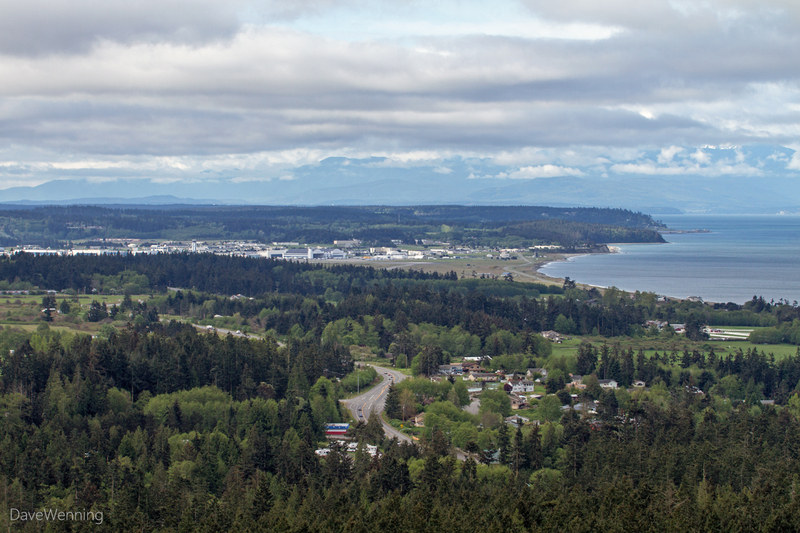 Near the center is the Whidbey Naval Air Station. 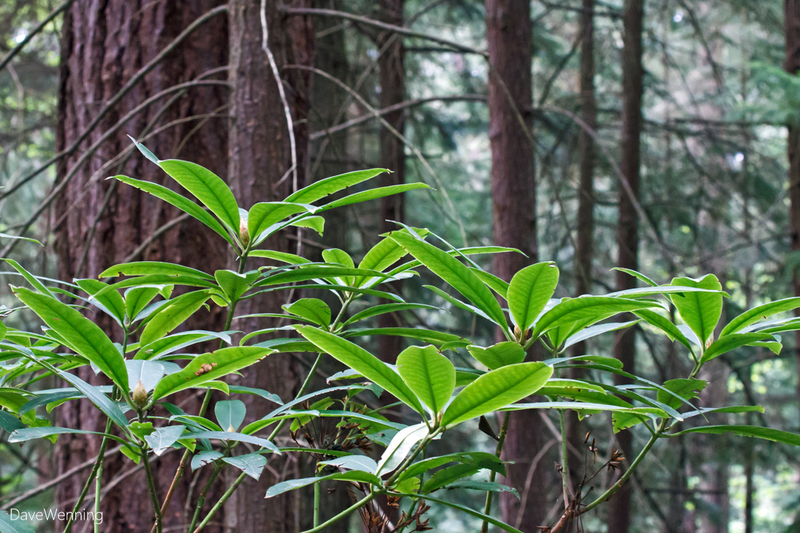 While the weather cooperated, the Pacific Rhododendrons at Deception Pass State Park did not. The buds have not changed since my first hike into the grove. By this time last year, there was definite color showing. Still, only that one atypical blossom we have seen in the previous posts is showing its stuff right now. 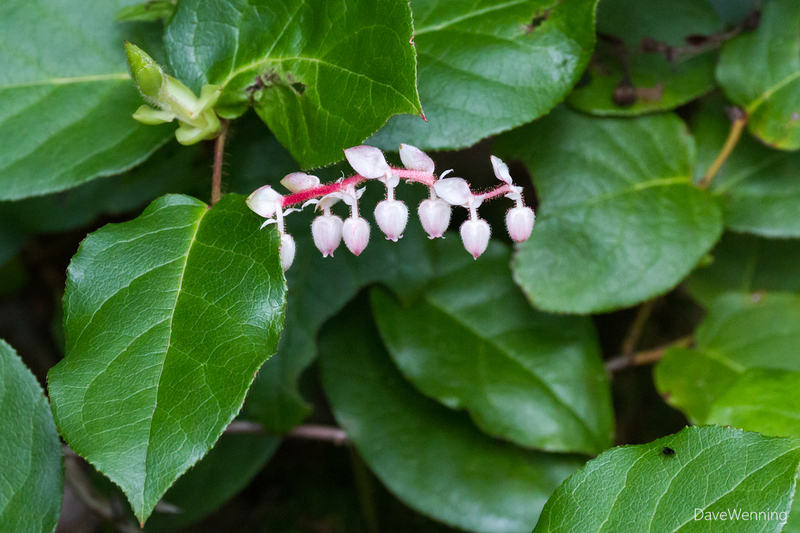 Left: Salal (Gaultheria shallon) is in full bloom. This is a cousin of rhododendrons in the same Ericaceae or Heath family. 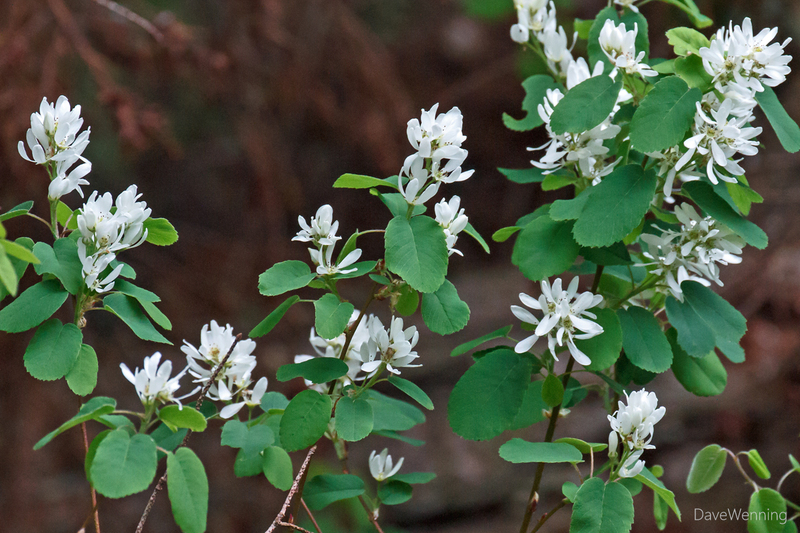 This is one of the most abundant understory shrubs in the Pacific Northwest. I have a lot of this in my garden. It makes a nice evergreen ground cover that will grow in harsh, conditions. It also provides cover for wildlife. Right: Western Serviceberry (Amelanchier alnifolia) is blooming on the south slope of Goose Rock. Also called Saskatoon (the Canadian city was named for it), I want to plant this beautiful native shrub in my garden I hope I can find it available. Watch your step when hiking in the Pacific Northwest. 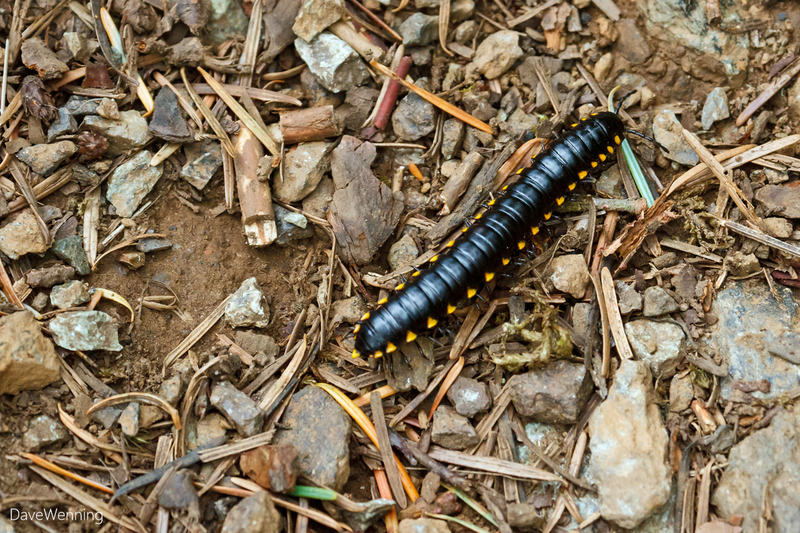 I encountered two interesting and valuable critters on the trails yesterday. Yes, valuable. Both of these recycle plant material and turn it into soil that nourishes the forest. Hikers, please give these humble creatures your respect and protection. Remember, this is their world, not yours. 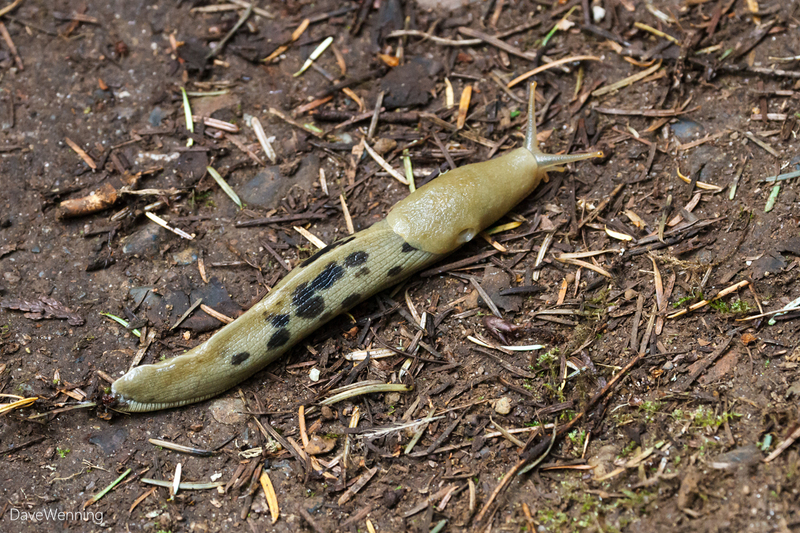 Left: The Banana Slug (Ariolimax columbianus) is the unofficial mascot of the Pacific Northwest. They are not garden pests and should never be regarded as such. Somewhere, I read that they recycle 11% of the forest biomass every year. I was actually pleased to discover them in my yard. I cannot determine they have ever done damage to the plants. That distinction is left to the introduced black, red and gray European slugs. Right: The Cyanide Millipede (Harpaphe haydeniana) may look threatening, but it's not. Volcano Lands in Portland has a great post about it that explains the purpose of the bright yellow markings. If you disturb them, they emit cyanide gas, but not enough to be harmful to people. This is a defense against predators. Like the Banana Slug, they are valuable to the forest and should not be harmed. 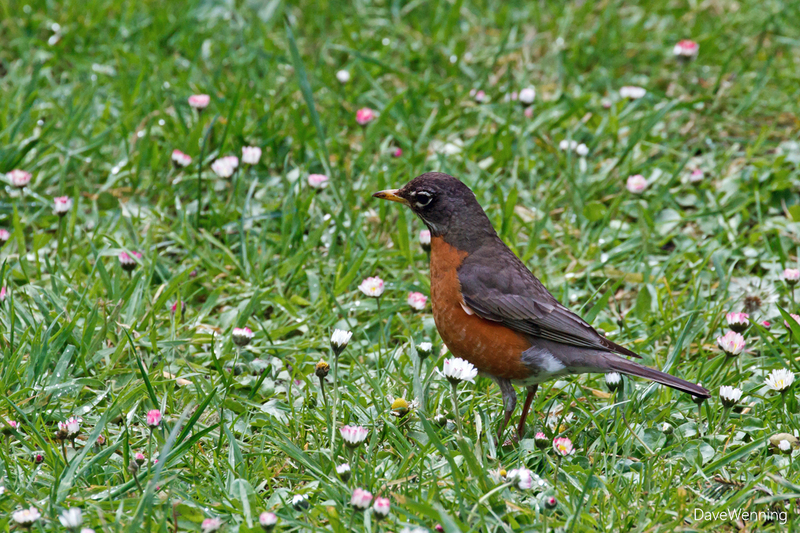 Back at the parking lot, American Robins (Turdus migratorius) were patrolling the grass listening for worms. The little flowers are English Daisies (Bellis perennis) which is an introduced species from Europe. The name daisy comes from Anglo-Saxon. It means "eye of the day" or "day's eye" because the flowers close at night and reopen at sunrise. I will be hiking the Rhododendron Trail at Deception Pass again this coming week. 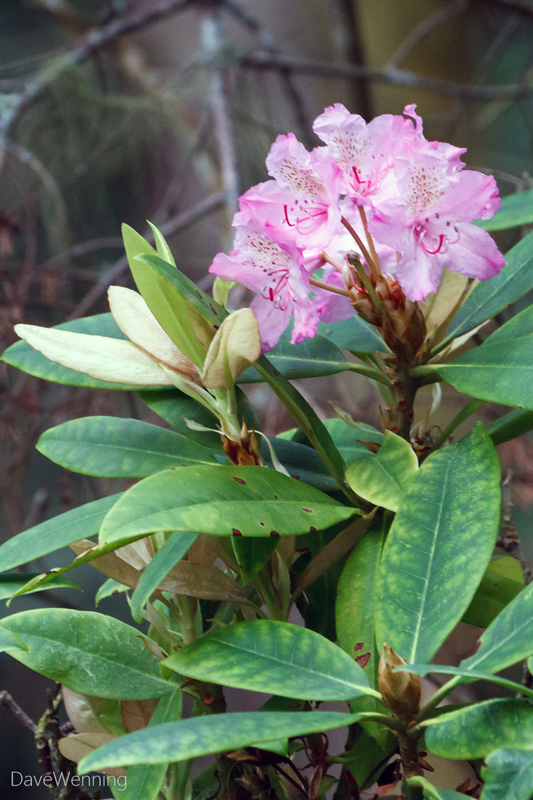 I will expect the rhododendrons to get with the program and start opening those buds. If you want to come along, watch my Twitter feed and look for the hashtag #rhodyhike. I will announce dates and times there. Weather permitting, I anticipate the next one will be Tuesday, April 28th at 08:30 a.m.